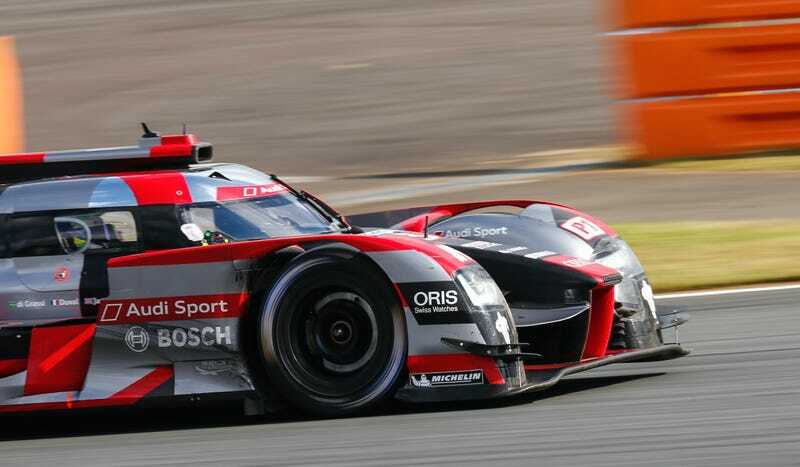 Audi announced this morning that they will end their participation in the series it spent a decade dominating, the World Endurance Championship—including the 24 Hours of Le Mans—to shift their focus to the all-electric Formula E championship instead at the end of 2016. It’s one of the biggest shifts the racing world has seen in some time. The costs of Dieselgate have, in fact, reared their ugly head over at Audi, as they explained in today’s press release that “burdens on the brand” forced them to focus on things that can keep the brand competitive in years to come. That means focusing development on electric cars, and jumping into motorsport where they can do electric development over, say, a diesel-powered Le Mans prototype, as Volkswagen Group diesel efforts are now pretty irredeemable to the public eye. Audi wants to have full-electric-powered models up by 2018. We’re going to contest the race for the future on electric power. As our production cars are becoming increasingly electric, our motorsport cars, as Audi’s technological spearheads, have to even more so. Stadler told 300 employees at Audi’s motorsport department Wednesday morning of the changes to the brand’s motorsport strategy. Their commitment to the Deutsche Tourenwagen Masters series remains unchanged, although no decision has been made on their participation in World Rallycross yet. Formula E may not be the darling of fans yet, but it’s certainly the darling of manufacturers right now. It’s an easy sell to sponsors who want to be seen as “green,” and thus, easy to fund. Audi recently increased their works participation with the Team ABT Schaeffler Audi Sport team in Formula E for the 2016-2017 season. Either way, it’s sad to see one of the most dominant Le Mans teams leave endurance racing’s highest level. Audi racked up an incredible 13 Le Mans victories in its 18 years of participation. I can only hope that battery tech evolves to the point where the two efforts can align again, and maybe an all-electric car won’t have to be a special, one-off Garage 56 weirdo entry. But it’s also the biggest thing to ever happen to Formula E, by far. The upstart series, now in its third season, has attracted Jaguar and Williams Racing, but Audi is a tremendous get for the electric series given how much it ruled over WEC for so long. Audi’s withdrawal leaves only two manfacturers in WEC’s LMP1: Toyota and of course, Audi’s Volkswagen Group sister-brand Porsche. Is Audi About To Leave Le Mans?